I invite you to join me for a "Once in a Lifetime Experience" to see the very places where Jesus walked, taught and lived His earthly life. Come with me on a tour of the Bible Lands. The Bible will come alive for you. I would like to share this experience with you and encourage you to join me. I am certain you will return Filled with enthusiasm, gratitude and a renewed faith. "To walk in the footsteps of Jesus cannot be described. It can only be experienced." I am certain you will return Hilled with enthusiasm, gratitude and a renewed faith. "To walk in the footsteps of Jesus cannot be described. It can only be experienced." LAST DAY to support your favorite cause! You still have time for your end of year gift…. "Pastor, Help us! we don’t have anything to eat". It is the phrase I hear in the villages. One of the issues is the lack of jobs; they don’t have resources to make the land produce and the lack of food makes them sick. The families are large, and the few things they get are not enough. We have been preaching the Gospel through the missionaries and the Church, we bring medicine and food but It is not enough. We must continue helping one another. This is a letter from Pastor Reynaldo simply telling everyone what he faces everyday. 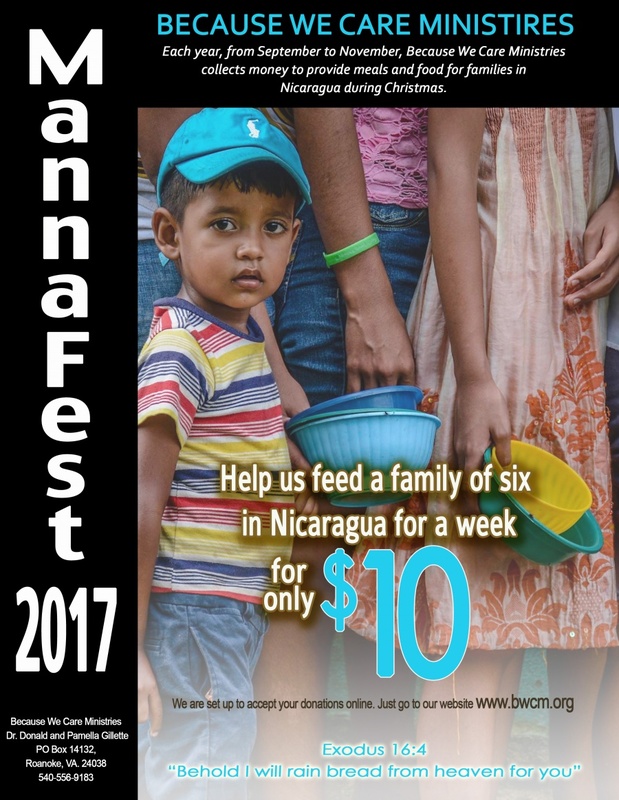 I praise GOD for HIS provisions and ask that you pray about helping BWCM with "Manna Fest." Never in our 17 years of service has it been so difficult to start our Christmas feeding program, Manna Fest, because of all of the needs here in the USA. BWCM has been active in helping in Texas and working now to help in SC and FL in the next few days with hurricane relief. With that being said, we still have a need to feed the people in Somotillo Nicaragua. Each year around Christmas, with the help of our many partners, we are able to provide food to hundreds of families and share the GOSPEL. We will continue to pack bags of food that will feed a family of six for only $10.00. We are asking for your prayers and financial support. Thank you so much and God bless.